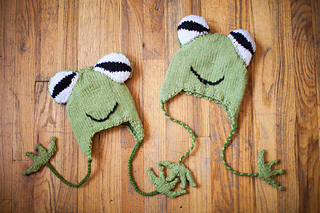 This adorable hyla tree frog hat comes in all sizes (Child, Teen & Adult). It’s bound to spread cheer - even on the gloomiest days. Pattern is modular, pieces are assembled at the end. Short rows are required. One skein of Fern/Grass is sufficient for 2 children’s hats, or one child and one teen. Please Note: Bernat has changed their line of Chunky yarns. They are now thicker, and have a different gauge. 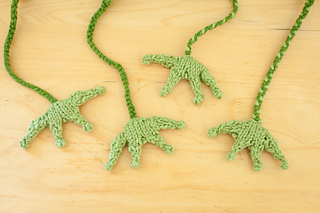 This pattern was written for the original FERN chunky. 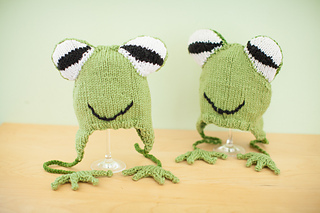 You can substitute Lion Brand Homespun - Apple Green, or another yarn that gives you the correct gauge. (you can also adjust the needle size if necessary).